Situated mostly in the Northwest United States and in Canada after migrating from the Great Lakes region, the Blackfoot Indians have a rich history and culture. Blackfoot Indians were legendary buffalo hunters, and lived a mostly nomadic life following the buffalo herds. The name of the Blackfoot comes from the English translation of the word Siksika, which means "black foot." It refers to the dark colored moccasins the people traditionally wore. They are sometimes referred to as Blackfoot and other times as Blackfeet. 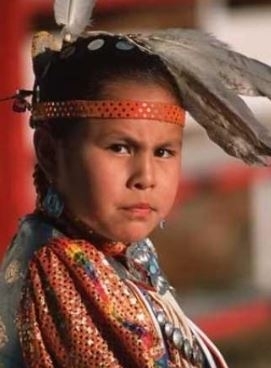 The majority of Blackfoot people speak English today, but about half also speak their native Blackfoot language. Blackfoot is a musical language that has complicated verbs with many parts. Their traditional beliefs include believing nobody is born evil, that truth and honesty are the basis of leading an honorable life. As a result, they value that all people deserve respect whatever their age or rank, and that a good sense of humor is essential if one wants to live life to the fullest. Pray for Blackfoot to experience abundant life in Christ. Pray for Blackfoot believers to stay strong in their faith and be a vital witness to their community. Pray for Blackfoot churches to multiply and thrive, and to catch a vision for reaching out to people groups around them and around the world.